In line with our dedication to an environmentally friendly operation, a Euro 6 investment plan is now well under way with the arrival of a new 18T rigid, and a new 38T tractor unit in the first quarter of 2015. Later this year will see the arrival of new 7.5T and 12T Euro 6 rigids, as we begin to phase out some of our older Euro 4 fleet in a bid to operate one of the greenest fleets in the events industry. Also coming this year to The JT EventTruck articulated division is a brand new Schmitz Opensider 45ft trailer, enabling us to continue offering our customers truly flexible solutions – suitable for transporting anything from custom bulky exhibition set pieces, to festival site generators and mains distribution – but with the security of a rigid box rather than a curtain side. Exhibition Project Management abroad? You got it! JT EventTruck were commissioned to transport a complex exhibition build for a global airline company out to three venues in Italy, including a dedicated on-site support crew. In order to access the venues, a combination of two 18T rigids and one 3.5T van were dispatched from JTHQ for three weeks in May. All vehicles supplied included working tech-savvy drivers, who assisted with the load in and build days. 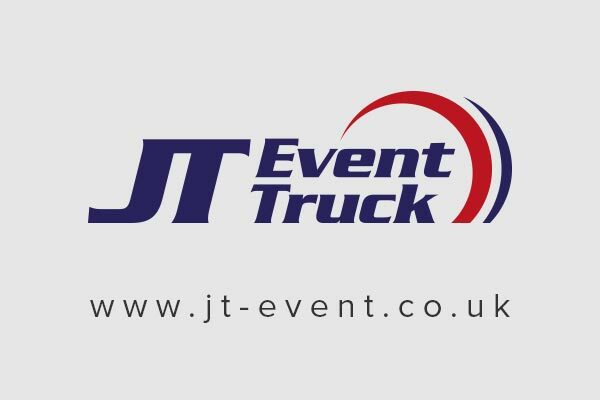 JT EventTruck then supplied another two site crew to assist running the events themselves, and liaise with the end customer to ensure all snags and finishing touches associated with the stand build were taken care of. The project completed successfully, and conversations are already underway for another visit out to Spain later this year involving two trucks and a much larger team of eight crew… On our next outing we’ll endeavour to get some pictures, to show off how versatile the JT EventTruck driver team can be with a screwdriver and an air compressor!